For the past two years, 25-year-old Kacie Shaffer has had the opportunity to beat the Beast not once, but twice. No, Kacie doesn’t run the Barber Beast on the Bay Adapted Course twice. 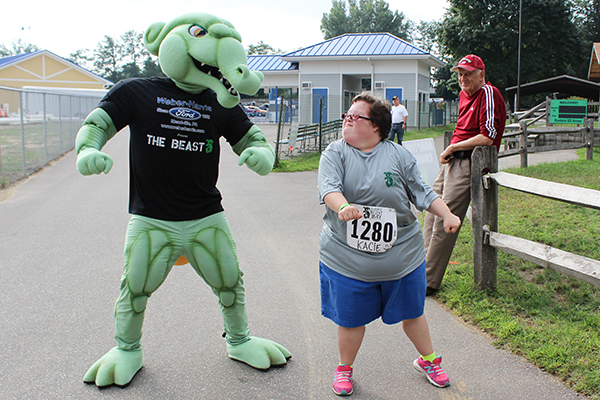 Instead, she’s taken on the Beast mascot before the race in a dance competition with a boogie the Beast just can’t best. It’s all part of the fun participants in the Adapted Course have as part of their experience with Barber Beast on the Bay. The one-mile course at Waldameer Park is held primarily on paved road and features nine obstacles that involve pulling, pushing, carrying and navigating ramps. All obstacles are optional and can be completed by participants who are ambulatory or using a wheelchair, walker, or other assisting devices. Kacie’s unbridled exuberance for the event carries over each year not only at the event, but also in waiting for the next one. Kacie has had many favorite things over the course of her Adapted Course career.